The National Park at our feet like so many thousands of acres of Costa Rica is full of animals. Every day we walked along the shaded sandy path in the woods and swamps — sometimes to the end of the point and the beginning of the reef — and every day we swam along the beaches. And without trying, this is what we found. So I’m sitting on the beach minding my own business and this sand crab, about the size of a baseball, pops out of his hole and starts eyeing me, then does this weird thing where one eye on its long stalk starts to bend backwards. I try to ogle him in kind, but don’t quite have the knack. We repeat this game several times until he goes back in his hole for good, disappointed I’m sure at my lack of finesse. So I’m sitting on the beach and the tide is coming in, so I move my towel back and stick my bag behind a log. Then I go for a swim. Doug is lying on the sand and hears this noise, turns around, and finds a White Face monkey going through my bag, evidently trying to make off with it. They have a staring contest and the monkey scrambles up in a low-lying branch overhead, where he’s still in wait when I return, hoping I guess I’m a sucker for monkey business. So we’re walking along the sandy trail and we see a German guy getting quite excited, and we go over to where he’s standing and take a look. There, wrapped around a slim tree trunk is a bright yellow Eyelash Palm Pitviper. Now I’m no fan of poisonous snakes (nor large constrictor ones either for that matter), but I try not to get all freaky about them, like the young Parisian hitch-hiker we picked up who wanted me to tell her how to avoid even seeing one. Hard to do in a country crawling with them, and the area where we were was thick with the deadly fer de lance. As for the Eyelash Pitvipers, I tried to be casual when I mentioned this to the ranger before leaving the park. I know they run a close second to the fer de lance in human fatalities. 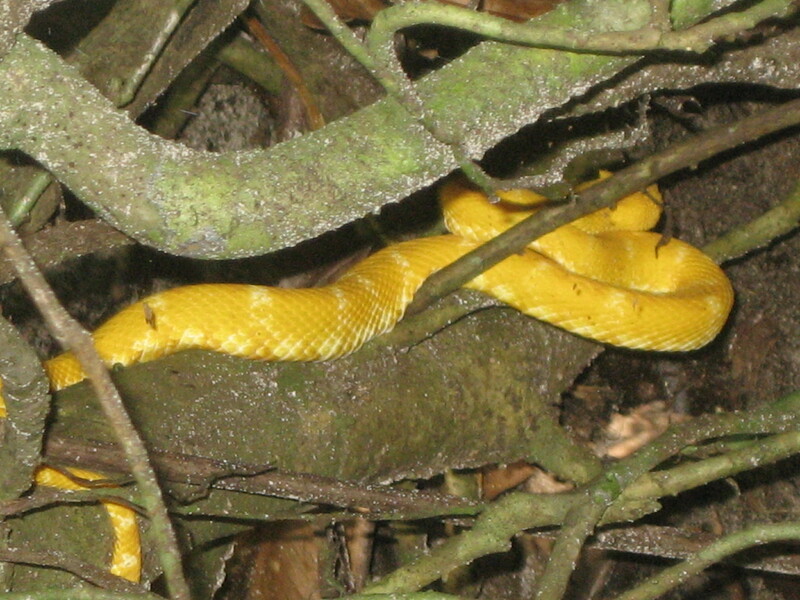 “So, we saw a yellow Eyelash Pitviper,” I told her casually. “Do you have many of them here?” “Ah, si,” she said proudly and went on to ask if we’d seen any of the blue, red, pink, green or cocoa-colored ones as well. So we cross rust-colored rivers (where Doug was advised not to go up to fish — crocodiles) and get to the end of the trail where the reef starts in the sea. And we hear this crashing and rustling. Monkeys looking for my bag I think. 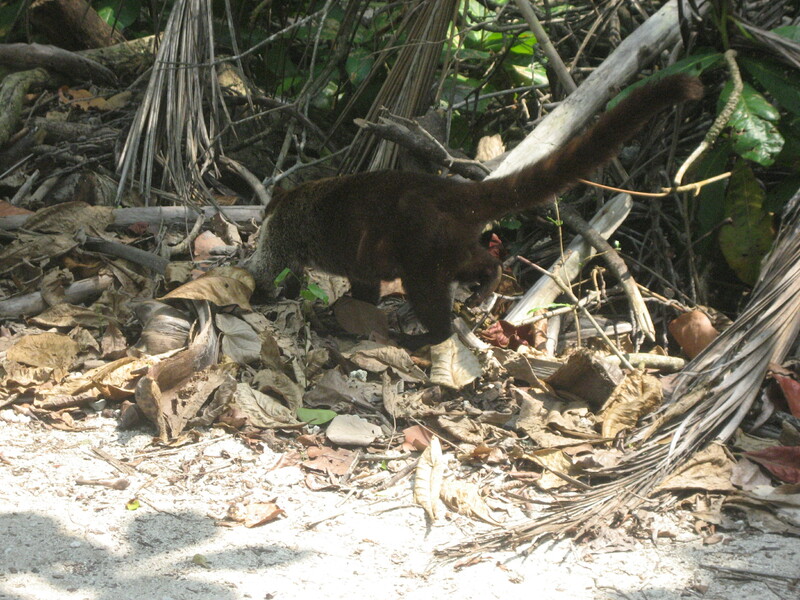 But no, it is a pair of Coati swinging from a tree. We’ve seen them before, but they still look like an anteater trying to turn into something else. 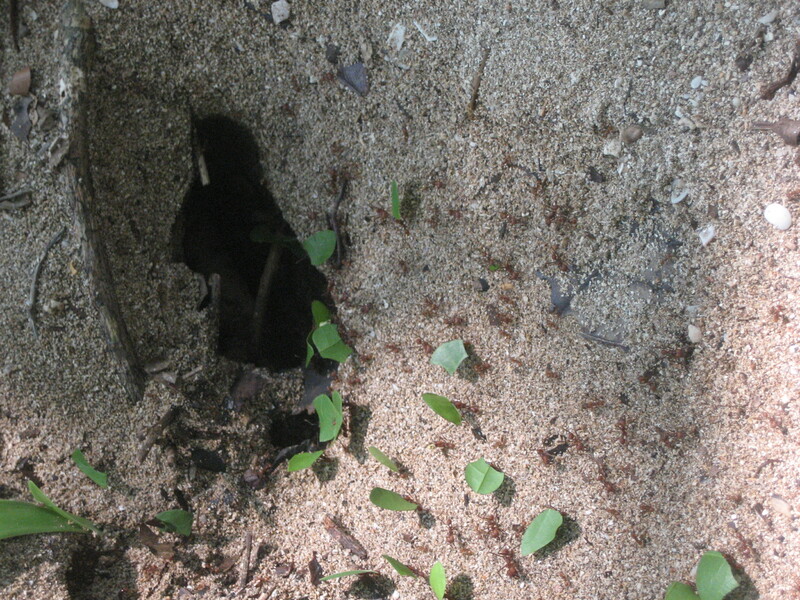 So, walking the sandy trail, one of the most noticeable things crisscrossing the path are the lines of walking green ants carrying bits of green leaves larger than their bodies. These are not surprisingly, Leafcutters, and their abilities to cut leaves, carry them, line their nest with them so they’ll ferment into food, are quite astonishing. So are the huge mound, cities, pyramids, they engineer — also, I presume, like the ancient humans in these jungles, without use of the wheel. What work, exactly, the crabs do at night remains one of Cahuita’s many mysteries.